Michael McFadyen's Scuba Diving - Cessna 402 - Madang The town of Madang is often called the "prettiest town" in the whole Pacific. I must say that I agree with this description as it is very beautiful and ideally located on the shores of Madang Harbour, a harbour that comes close to Sydney Harbour in terms of size, protection and beauty. Numerous parks, lagoons and creeks are found in and around the town and there are plenty of trees that add to its appeal. To the north there are three other harbours, Nagada, Mililat and Sek Harbours. In reality, these are really just parts of the one, huge harbour protected from the open ocean (not that there is any real big seas) by a barrier reef and a number of small islands. The vast majority of the diving here is carried out in and around these harbours. On a dive trip to Madang in Papua New Guinea in 1996, I was able to dive a number of wrecks, amongst them two aeroplanes. While most people go diving in New Guinea for the reefs, there are some excellent wreck diving all around the country. As well as the famed Blackjack Boeing B-17 located far to the south from Madang, there are a number of other planes to dive in PNG. One of these is a B-25D Mitchell bomber and the other is a Cessna 402. Some of the most amazing dives I have ever done have come about by pure chance or a small remark by a person. 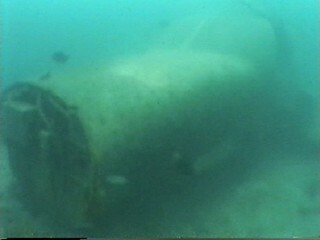 Such is the case with this dive on the wreck of a Cessna plane as you will read later. The Cessna 402 is a "third level airliner" (to quote a source book) and is a 10 seater, twin engined plane. With a wingspan of 12.2 metres and a length of 11 metres, the plane is powered by two 300hp Continental flat-six engines (like a Subaru's engine). In approximately early 1991, this plane, registration P2-GKH owned by North Coast Aviation (NCA), was flying to Madang when it ran out of fuel (so I was told by a former pilot of NCA) and crashed into the ocean near Pig (Tab) Island off Jais Aben Resort. As this pilot told me over a beer on an Air Nuigini plane, it was the most preventable of accidents. After the accident (in which everyone survived), the plane was towed into Jais Aben Resort for some reason (so it could be examined by investigators?) and dumped off the resort's wharf. It now lies in a maximum of 11 metres of water. On my first visit to Madang I was not even told about this plane but on my most recent trip one of the local divemasters told one of our group about the plane. He then told the rest of the group about the plane. The plane is fully intact and lies only 15 metres from the wharf. After a dive, it is a simple matter of keeping 50 bar of air and instead of off-loading your gear onto the wharf, you put it back on and drop off the boat or wharf and swim down to the wreck. Apart from major damage to the fuselage at the rear door area where the plane has broken its back and a missing nose cone, the plane suffered little damage from its ditching. You can enter the plane through the door on the port side and go right up to the cockpit. Some of the seats are still in place as are most controls and gauges. Inside the plane you can see x-ray fish (I do not know their real names) which are small fish about 25mm long and with transparent bodies. Near the door there are a number of striped pipefish, but these are unlike any I have seen in PNG fish books. These fish are striped (obviously) but have a brilliant red and white horizontal striped tail. Very beautiful. You can also look through the pilots window/door which opens. The port engine cover is missing and you can see the engine. Although the plane ran out of fuel, the props must have been turning over, albeit slowing, as each blade on the two props are bent back by the force of the water as the plane hit the ocean. 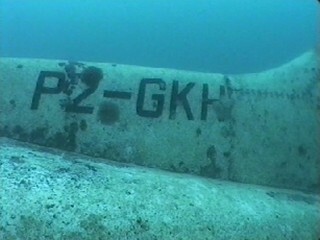 The plane has wingtip fuel tanks which have collapsed under the water pressure, proving they were empty when it sank. 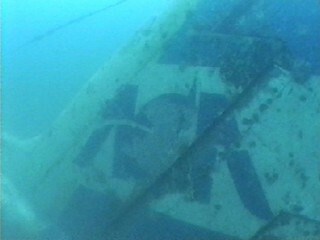 The plane's registration number P2-GKH can be clearly seen on either side of the upper fuselage and the name "North Coast Aviation" is faintly visible while "NCA" is prominent on the tail. The rudder moves easily but other parts (aerilons etc) do not. While you can easily see the whole wreck in five minutes or so, a more realistic dive is 15 to 20 minutes as you examine the plane in detail. An excellent third dive for the day, so much so that I made it my one thousand dive! The water temperature for these dives was a minimum of 29°C, extremely pleasant. The visibility ranged from eight to ten metres, more than enough to fully enjoy the planes.